The sow ended up with about 10 piglets. With only 14 teats, how many can she really support?! They are busily and nosily feeding all day long. All night too. At this stage they eat every hour. She moved herself so her back is against a wall, none of the piglets can get behind her. Plenty of water available to her. For these early days the bedding is hay, sweet smelling and tasty...she can have it as breakfast. The dirty eggs go to her. Along with brick hard old bread and vegetables that have turned a bit, and a bit of traditional feed. 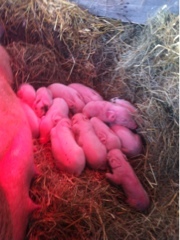 A gal needs her strength to nurse 10 piglets! Our boar is proven. He is gentle and calm, and will have the opportunity to visit some other farms to cover their sows. A lucky fellow.